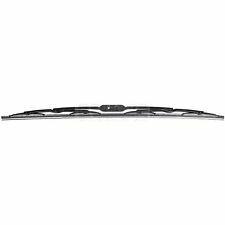 BOSCH Direct- Connect OE-Fitment Wiper Blade Set of 2 Front Left+Right 22"&16"
Part Number(s): 15237916. Impala, Monte Carlo. Without police model. Part/Notes: DRIVER WINDSHIELD WIPER ARM. For clarity, passenger side refers to right side when sitting in vehicle, and driver side refers to left side when sitting in vehicle. The Rain?X® Professional Wiper Blade provides a smooth, clean, streak-free wipe by using embedded friction reducers and multiple pressure points. Quick and easy to install – pre-installed with small j-hook adapter and contains multi-adapter for side pin, large j-hook and bayonet wiper blade arms. 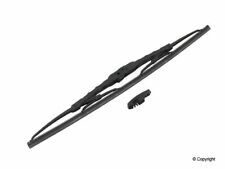 1x Bosch Icon Passenger Side Wiper Blade (22B). see list above. 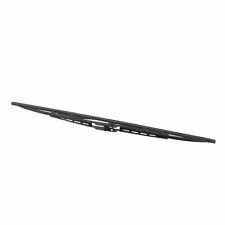 1x Bosch Icon Driver Side Wiper Blade (22A). 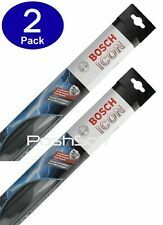 Bosch ICON Wiper Blades - Set of 2 (Size: 22" / 22"). The best solution for the winter season is the ICON beam wiper blade. 1978 - 1988 Chevrolet: Monte Carlo. 1978 - 1987 Buick: Regal. Fits the following (but not limited to ) 1978-1981 GM A-Body & 1982-1988 GM G-Body. Windshield Wiper Arms. GM A & G Body Models. The PIAA Si-Tech Flat Wiper Blade part number 97055 is an all-season, durable wiper blade that incorporates PIAA's patented silicone rubber. The key to the PIAA Si-Tech's performance is its frameless design that creates more pressure points across the entire length of the blade for streak-free wiping and greatly reduced ice and snow build-up. The wiper design and blade compound ensure even greater visibility by coating the windshield with silicone to promote continuous water beading in inclement weather. The silicone coating also reduces drag and eliminates annoying and inefficient chattering and squeaking, regardless of the shape of the windshield, to provide greater comfort for both driver and passenger. 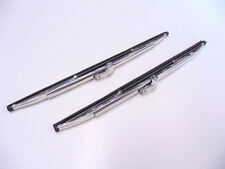 And the best part: the PIAA Si-Tech Flat Wiper Blades reapply the silicone coating every time the wipers are used. 5 out of 5 stars - 97055 PIAA Si-Tech Flat Windshield Wiper Blade 22"
1 product rating1 product ratings - 97055 PIAA Si-Tech Flat Windshield Wiper Blade 22"
Genuine Bosch Direct Connect Wiper Blades - Set of 2 - "OEM" Quality 22" 22". 1x Driver side wiper blade. 1x Passenger side wiper blade. Bosch's 'DirectConnect' system allows for easy one-step installation. Bosch Direct Connect Wiper Blades - Set of 2 (Size: 22" / 22"). Bosch's 'Direct Connect' system allows for easy one-step installation. Genuine BOSCH. Instructions included. (1) Driver Side Wiper Blade. Part Number: Piaa Lighting. GREAT ITEM! 3173 Communication. 2955 Item as described. ATV Accessories. Interior Parts & Accessories. Condition : NEW. Exterior Parts & Car Care. Trending at $24.71eBay determines this price through a machine learned model of the product's sale prices within the last 90 days. Product Type: Wiper Blade | Replaces: 22101870 1L5Z17528AA GU2Z-17V528-J 5515 6664AA 5L8Z17528AB 8350 5422 | Wiper Blade Length: 16", 18", 18" | Source: OEM . BUICK CENTURY 1997-2005 Part Number: XV22 XV22. All Season Wiper BladesApplications for This Part. Don't see what you are looking for?. Bosch Direct Connect Wiper Blades - Set of 2 (Size: 18" / 18"). Bosch's 'Direct Connect' system allows for easy one-step installation. Genuine BOSCH. Instructions included. (1) Driver Side Wiper Blade. BUICK CENTURY 1978-1996 Part Number: XV18 XV18. All Season Wiper BladesApplications for This Part. Don't see what you are looking for?. Genuine AERO wipers. Not knockoff. 6-month warranty. Includes:2 pieces genuine all-season wiper blades. Driver Side: one 22" J-Hook wiper blade. Passenger Side:one 22" J-Hook wiper blade. Only fit "J-Hook" wiper arms. No Instruction Included. As the pictures shown. 1968; Rolls-Royce; Silver Shadow. 1969; Rolls-Royce; Silver Shadow. 1969; Saab; Sonett. 1969; Saab; 96. 1969; Saab; 95. 1969; Rover; 3500S. 1969; Rover; 2000. 1964; Rover; 2000. The price is for 01 set of 02 refills. Total = 02 refills. Bosch " Direct Connect " Wiper Blade Set. Bosch Is A Top Windshield Wiper Blade. Trending at $6.23eBay determines this price through a machine learned model of the product's sale prices within the last 90 days. 1978 - 1988 Chevrolet: Monte Carlo. 1978 - 1987 Buick: Regal. Windshield Wiper Arm. Fits the following (but not limited to ) 1978-1981 GM A-Body & 1982-1988 GM G-Body. GM A & G Body Models. Top-Of-The-Line Wiper Blade. Trico NeoForm Super-Premium Beam-Style Wiper Blade. Quantity 1 ( Sold Individually ). Fits driver-side/left and/or passenger-side/right side (either/both). TRICO also produces the original wiper blades on a huge amount of USA-manufactured vehicles and works closely with automotive manufacturers to engineer entire wiper systems (including the original wiper blades) on many new vehicles. Blade Style : CONVENTIONAL. Interchange Part Number : AA-2518, 31-18, 40718A, 11181, 160-1118, 18-2, 18. Part Numbers: 103213, 11181, 160-1118, 18, 18-2, 18-52, 2018, 20181, 21-0933-0, 251-180, 30-180, 30164, 31-18, 40718A, 50018, 60018, 728-18, AA-2518, BC30218, P7030-333196-TRI, RX30118, SBV181, SG18, TFX18-2, WW-1802. 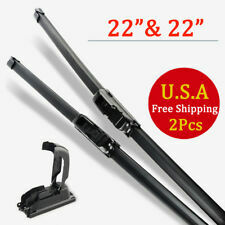 1 Pair H&L Windshield Wiper Blades 22". Easy to install – pre-installed with small j-hook adapter and contains multi-adapter for side pin, large j-hook, bayonet, I&L and PTB wiper blade arms. We will try our best to help you. Wiper Blades. 1984-1988 BUICK CENTURY (Wagon). 1984-1989 BUICK SKYHAWK (Wagon). Part Type: Windshield Wiper Blade. 523-20-16:REAR,2 pcs. Position: REAR. Ignition Coil. 1991-1992 CHEVROLET CAPRICE (--). THESE WILL FIT BOTH TYPE OF ARMS SHOWN IN THE PHOTO. SEE COMPATIBILITY CHART FOR APPLICATIONS. 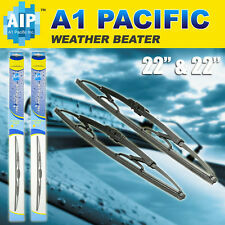 BUYING A QUANTITY OF 1 WILL GET YOU ONE PAIR(2) WIPER BLADE ASSEMBLIES. • Are incomplete or missing parts; or. Includes:2 pieces genuine all-season wiper blades. Driver Side: one 22" J-Hook wiper blade. Passenger Side:one 22" J-Hook wiper blade. Only fit "J-Hook" wiper arms. Product Detail. Refill Material : STEEL. The engine types may include 7.5L 7456CC 455Cu. V8 GAS OHV Naturally Aspirated, 6.3L 6286CC 383Cu. V8 GAS OHV Naturally Aspirated, 2.6L 2555CC 156Cu. l4 GAS SOHC Naturally Aspirated, 9.1L 555Cu. All-Weather Performance including improved cold weather and snow/ice performance over conventional wipers. Easy installation. TRICO also produces the original wiper blades on a huge amount of USA-manufactured vehicles and works closely with automotive manufacturers to engineer the entire wiper system on many new vehicles. Bosch Direct Connect Wiper Blades - Set of 2 (Size: 17" / 17"). Bosch's 'Direct Connect' system allows for easy one-step installation. Genuine BOSCH. Instructions included. 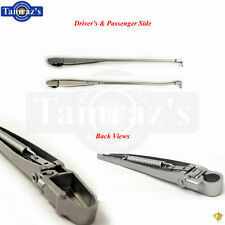 (1) Driver Side Wiper Blade. 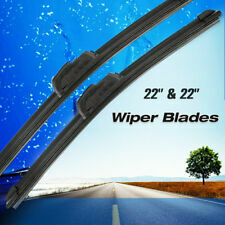 The Rain?X® Weatherbeater® Wiper Blade provides a smooth, clean, streak-free wipe by using. All natural squeegee rubber – resists cracking, splitting and tearing caused by heat, cold, windshield wiper fluid and salt.